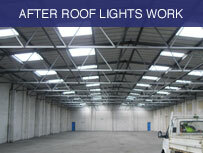 We can add roof lights to an existing roof in order to increase the amount of light entering the building. 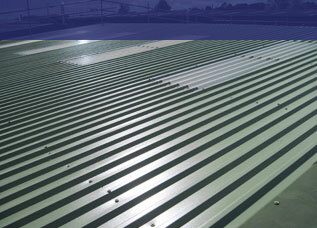 This can also assist in reducing the running costs of a commercial building. Our roofing team can incorporate roof lights into any new build or new roof installation. In addition, we also can replace old roof lights as cleaning is not always an effective solution where light levels have been reduced due to age or other factors. 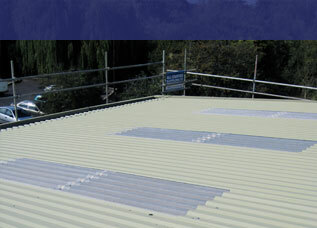 We use a variety of roof light products, depending on your individual needs and budget. One rooflight system we often use is the Brett Martin Daylight System, which is an effective means of using natural light to illuminate a range of buildings and can be cost effective and versatile. A member of our team can help you to find the best product for your needs. The main benefits of using GRP roof lighting are that it provides high levels of light transmission and uses diffused light whilst minimising shadows. 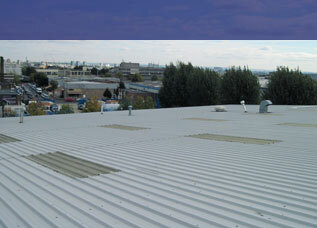 This makes it an effective solution for commercial and industrial buildings. 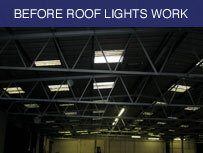 If you are considering having roof light work undertaken, then please do not hesitate to contact a member of our team.